It would be great to say that with their final studio album Led Zeppelin lit the blue touch-paper in a fireworks factory. Sadly, their sign-off was more like a match burning out in an ashtray. Sometimes nothing less than a good old-fashioned cliché will do. So here goes: with In Through The Out Door, their eighth and final studio album, Led Zeppelin went out with a whimper rather than a bang. Whichever way you look at it, when In Through The Out Door was released in August 1979 the musical climate was plain wrong. In the big wide world outside the closeted confines of Zep, disco, punk and new wave held sway. The advent of Spandau Ballet, Visage, Gary Numan, Duran Duran and the electronic movement that would initially be dubbed ‘futurist’ was also just around the corner. As well as the release of …Out Door – a No.1 album on both sides of the Atlantic, let us not forget – in ’79 Zep would enjoy massive live success at Knebworth. In many ways they were still untouchable. But the world was changing. Had changed. The Ringwraiths had tethered their demonic steeds. There was precious little magic in the air. Fairies, goblins and gremlins were nowhere to be seen. Despite their perceived stature, Zep weren’t really kings of the world anymore. In rock circles, Jimmy Page and Robert Plant were being superseded by a new breed of hero. Eddie Van Halen was doing stuff with a guitar that had never been seen – let alone heard – before. Meanwhile his star-jumping jousting partner David Lee Roth was taking the Golden God template created by Plant to an entirely new level. Within Zeppelin trouble was brewing – as ever. Page’s heroin addiction was becoming increasingly problematic and debilitating. When John Bonham wasn’t chasing the dragon like Jimmy, he was chasing the vodka bottle. Robert Plant was still coming to terms with a tragic event in his personal life: the death of his five-year-old son, Karac, from a respiratory infection in summer ’77. Robert sought solace in flagons of the finest Black Country ale. It was down to the ever-stoic John Paul Jones to hold it all together. After the best part of a year-and-a-half of confusion and uncertainty – which had all kicked off in July ’77 with the band’s infamous security-guard bust-up in Oakland, California – Led Zep defied the rampant break-up rumours and reassembled in London in December ’78. It was a brief but surprisingly productive meeting. Almost immediately afterward they began work on the album that would become …Out Door, in the unusual location of Stockholm, Sweden – at Polar Studios, a pristine new complex owned by ABBA. It was high-tech, and had lots of new electronic gizmos that the band were itching to try out. The temptation to twiddle was to prove part of …Out Door’s downfall. A land of near-24 hour sunshine in the summer, Sweden is bleak and forlorn in winter. As a result Zep didn’t hang about and the album was recorded in quick-fire fashion. There was no wild partying and a strict Monday-to-Friday working routine was established, with the band flying back home to Britain at weekends. It took just three weeks, and the record was done and dusted before Christmas. …Out Door is a Plant/Jones album rather than a Page/Plant album. And therein lies the rub. It has little of the dark guitar wizardry of other Zep releases. Page just doesn’t sound interested and his contributions are half- hearted. Despite his production credit he’s virtually a nonentity. There’s a preponderance of keyboards, and Page doesn’t even bother with rhythm playing on most of the tracks. John Paul Jones plainly felt it was his duty to rescue the project. You have to admire his dedication, but the appeal of …Out Door is severely diminished by his simplistic synthesiser playing. This problem wasn’t so much in evidence on the original vinyl pressings, which were thick and treacly-sounding in the finest Zep tradition. But listen to the CD version – amazingly digitally remastered by Page himself – and Jones’ contributions are much more to the fore. This is especially evident on the 10-minute-long Carouselambra where JPJ’s nagging fairground organ tones are all- pervasive, no matter how much Plant tries to inject an ‘ah-a-ah’ Achilles’ Last Stand-style vibe. Later in the track, Page’s absent-minded solo sounds like cats fighting. Is Led Zeppelin III the band's most important record? Greta Van Fleet: "There are worse things to be compared to than Led Zeppelin"
The aforementioned Carouselambra is one long jam. Epic and keyboard-fuelled, again it’s too loosely structured. You wait and wait for it to develop into something massive, brooding and …Graffiti-like, but it never happens. Just when you think the song is about to reach a climax it reverts to being laid back and genteel. 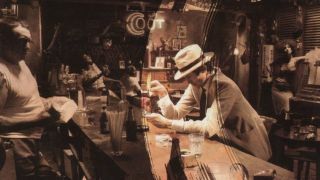 The original vinyl In Through The Out Door was released with six difference sleeves. Each was a photograph of the same scene but taken from a different angle: a man in a white suit sitting at a bar, burning a piece of paper. However, the session isn’t one of Hipgnosis’s best; the photos, with their props of upturned chairs and crushed beercans, are rather stiff and too obviously staged. It’s nowhere near as iconic as, say, Presence, with its mysterious black obelisk. The album was also encased in plain brown wrapping paper, so buyers didn’t know which of the six sleeves they were getting. As an added bonus it came with a couple of ‘art prints’ – black-and-white line drawings depicting ashtrays, fag ends and other barroom detritus. And if you sprinkled the prints with water they changed colour in the manner of a child’s magic painting book. Three tracks from the …Out Door sessions – Ozone Baby, Darlene and Wearing & Tearing – made it onto Zep’s posthumous odds-and-ends release, Coda, which came out at the end of ’82. The latter track proves the band still had it in them: a super-fast, high-octane, stripped- down workout, it could be regarded as a rollicking riposte to the punk movement. …Out Door would’ve benefited greatly from its inclusion. The title In Through The Out Door is reminiscent of more innocent times, when one would wait for the start of the main feature at the local cinema and then sneak in through the exit to see the film for free. Looking at what happened to Zep after the release of …Out Door, the exit theme is entirely appropriate. This feature first appeared in Classic Rock issue 84.